The concerts for kindergarten to Grade 4 students are based on a story “Daphne the Dinosaur, A Musical Tail,” by Ardyth Brott with Illustrations by Graeme MacKay. Boris Brott has a soft spot for kids. Since 1999, Brott estimates he and his National Academy Orchestra have performed educational concerts for more than 260,000 Hamilton schoolchildren. That tradition enters its 18th year this month with a series of concerts at Mohawk College’s McIntyre Performing Arts Centre that will be attended by more than 8,000 local students. That’s not to mention the hundreds of children’s shows Brott has done with the Hamilton Philharmonic and other orchestras around the world during his celebrated 50-year career as a conductor. It’s not an easy thing, introducing classical music to children that young. But Brott has a special talent for it, something he first learned in the ’60s working in New York as an assistant conductor to the Leonard Bernstein. He does it out of love — for music and children. Brott’s secret is to keep the programs fun, fast-paced and participatory. The key is to get the kids involved. Take the first four shows, being held Tuesday, Nov. 15, and Wednesday, Nov. 16. They’re aimed at the really young, kindergarten to Grade 4, and are based around a story — “Daphne the Dinosaur, A Musical Tail” — written by Brott’s wife Ardyth, a published children’s author. 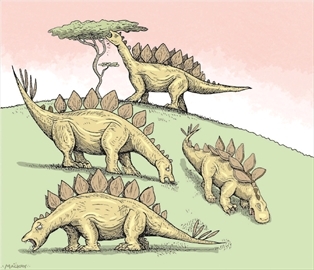 While following the story of Daphne, a lost stegosaurus, the young audience gets to sing along to Beethoven’s 9th and the Colonel Bogey March (both with lyrics adjusted to fit the story). They will also be introduced to Richard Strauss, Claude Debussy and the film scores of John Williams. The next four shows — Tuesday, Nov. 22 and Wednesday, Nov. 23 — are intended for a slightly older audience, Grade 4 to 8. Brott intends to grab them with a little help from rock ‘n’ roll. These shows are called “Rock the Orchestra,” with the NAO being joined by Bishop Ryan’s award-winning music teacher Dave Tabone and the high school’s band BR Xpression. One of the most interesting parts of the show will involve the orchestra performing Pachelbel’s Canon while Tabone and his band perform a medley of rock hits over it, including Journey’s “Don’t Stop Believing,” the Beatles’ “Let it Be” and U2’s “With or Without You.” It’s amazing how well the pop melodies fit with the Pachelbel. The kids will also get some Queen, Ozzy Osbourne, Fallout Boy, Tchaikovsky, beat boxing by Hachey the MouthPEACE, and a disco version of Beethoven’s Fifth. At this point, I need to confess my own involvement in the program. I’ll be helping host “Rock the Orchestra,” and introducing a couple of my own favourite rock/classical collaborations — Love Sculpture’s 1969 garage rock version of Khachaturian’s “Sabre Dance” and the “freakout” crescendo for the Beatle’s “A Day in a Life” (Paul McCartney conducted a 40-piece orchestra to get the effect). As you can imagine, maestro Brott is a persuasive guy. He also conscripted Spectator cartoonist Graeme MacKay to make some drawings to accompany the “Daphne the Dinosaur” show.